Random orbiting buffers (also known as car buffers, dual action polishers, or just car polishers) utilize an orbiting & rotating pad that generates a jiggling motion as you polish (Source). This unusual motion ensures that the dual action polisher doesn't burn car paint, which occurs when paint is removed beneath the coat's clear outer surface (Source). These dual action polishers are fairly easy to use- mainly because they don't run hot, especially in comparison to rotary polishers. The way they work, ​their head spins on a central spindle, which then rotates around an eccentric offset. To visualize this, imagine the earth's orbit- while the earth spins on its own axis, it also is orbiting around the sun (Source). It's important to note, ​that these dual action polishers won't buff out really deep scratches. They're capable of removing swirls and improving the appearance of scratches, but since they don't produce a lot of heat, they aren't equipped to cut deep into the paint coat (Source). Rotary polishers, on the other hand, are best wielded by professionals because their high pad spin speed will easily burn the paint coat if it isn't kept moving along the surface. Keep in mind, rotary polishers in inexperienced hands can quickly burn the paint. The pad spins at high speeds and it's up to the operator to keep the polisher moving at all times. If the polisher lingers for a second too long on one spot, it can burn through the paint. In our opinion, if you're looking for a more inexpensive, single-speed car buffer, check out either the Carrand or the Black & Decker, but if you need variable speeds for stronger polishing action, check out the Porter Cable variable-speed buffer. This orbital professional car buffer offered by Carrand is well-made, time-saving, reliable, and suitable for applying wax and polish. Users love that the buffer works quickly, but some do note that it vibrates too much. 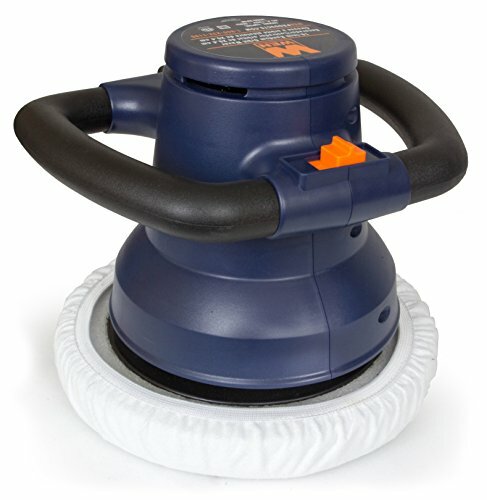 The Carrand polisher measures 11.2” x 11.2” x 11.2”, and it features a 120-volt motor, an RPM of 3500, a three-layer foam pad with a moisture barrier, a front-positioned handle, a top mounted on/off button, and a weight of 5 pounds. The package also includes a foam bonnet for smooth and even coverage, a polish applicator pad, and a microfiber buffing bonnet. A purchaser mentions that he used the Carrand orbital buffer to wax and polish a 2009 Honda Civil and that he was very surprised how quickly he managed to finish the whole job. A buyer states that the used the car buffer to apply and then remove the polish and that as a professional he finds it very useful and well-designed. Another user comments that this 10-inch orbital polisher works very well and that it’s not heavy at all. He adds that he waxed his boat and car in no time and that the included buffing pads are of good quality. However, some customers have complained that the car buffer stopped working after several uses and that it doesn’t polish as well as they expected. Some users also note that the buffer doesn’t spin as it should and that it would be quicker to do the job by hand than using the car polisher. This 6-inch random orbit waxer offered by Black & Decker is light, well-designed, powerful, and handy. Users love that the buffer is easy to use, but some do note that the switch should be improved. 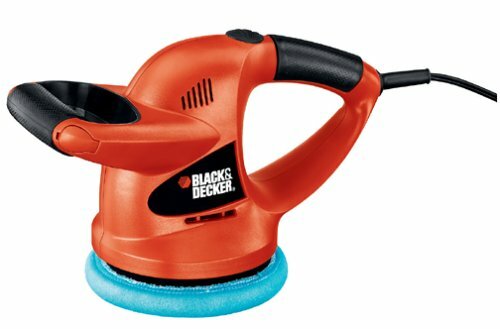 The Black & Decker polisher measures 13.8” x 6.2” x 8.6”, and it features 4,400 orbits per minute for professional results, a 10 ft cord, two-handle design for secure and improved grip, one foam applicator pad, two polishing bonnets, and a weight of 2 pounds. This random orbiter is a perfect choice if you want a swirl-free finish. A purchaser states that the random buffer works properly and that you can achieve amazing results with it. He says that the two handles are very convenient and that if you are new to buffing, you should watch some YouTube video to get the hang out of it. Another satisfied buyer mentions that the Black & Decker random orbit waxer is very light, quiet and that you can use it with one hand. The reviewer adds that he tried it on three different cars and that they all looked fantastic afterward. He recommends it to anyone looking for an efficient, but cheap orbit buffer. However, some customers have complained that the random orbit buffer is not as powerful as they expected and that the included buffing pads are flimsy and tear quickly. Some users also note that you’ll do a better job by hand because the machine is too weak. If you want to save time polishing your car, you might take a look at this orbital buffer offered by WEN. Users love the design and the lightweight construction, but some do note that there is only one speed. The WEN car polisher measures 12” x 12” x 10”, and it features a weight of 3.1 pounds, a high-performance 0.75-amp magnet motor, 3200 orbits per minute, and a high impact insulated housing. The package includes two applicators pads, two polishing bonnets, two wool blend polishing pads, one washing mitt, and a carrying case. A buyer comments that the car buffer works better than he expected and that it doesn’t leave any marks or scratches. He adds that the waxer is light, strong and suitable for a Christmas gift. Another happy user mentions that the orbit polisher is a real time-saver and that his truck looked as good as new when he finished. He highly recommends it as the best car buffer available. A user also shares that if you use the WEN car waxer correctly, you’ll achieve unbelievable results and that you should carefully follow the polishing instructions. However, some customers have complained that the car orbit buffer broke very quickly and that the motor is weak. Some users also note that they had problems with the foam pads. If you want a top-notch car polisher, you should consider this 6-inch random orbit buffer offered by Porter Cable. Users love the variable speed feature, but some do note that it vibrates too much. This orbital buffer measures 14” x 6.5” x 6”, and it features a two-position removable side handle for improved control, a proprietary counter balance, a variable-speed dial from 2.500 – 6.800 OPM, and a weight of 5.8 pounds. The car waxer accepts spindle thread accessories from 5/16 to 24, and the package includes a polishing pad, wrench, and operating instructions. In general, customers have a high opinion of the Porter Cable car buffer, and they agree that it’s one of the best random orbital polishers. A buyer comments that this is the safest orbital buffer and that you don’t have to worry at all about damaging your car. The reviewer states that it even removes heavy swirl marks and scratches and that he is immensely satisfied with the achieved results. Another user mentions that this car waxer is perfect both for amateurs and professionals and that it’s a pleasure to use it. A purchaser says that the car polisher is easy to maneuver and that it’s so light that you won’t get tired quickly. However, some customers have complained that the included pad is of poor quality and that due to the strong vibrations your hands get tired quickly. This random orbital buffer kit offered by Torq Torox is expensive, well-made, and suitable for professionals. Users love the quality of the accessories, but some do note that the package arrived with missing compounds. The Torq Torox car buffer measures 20.5” x 8.5” x 8.5”, and it features a weight of 8.6 pounds, streamlined controls, a balanced internal design, lightweight construction, a 680-watt motor, a PRM of 2800 -7800, and an 8-mm dual action orbit. 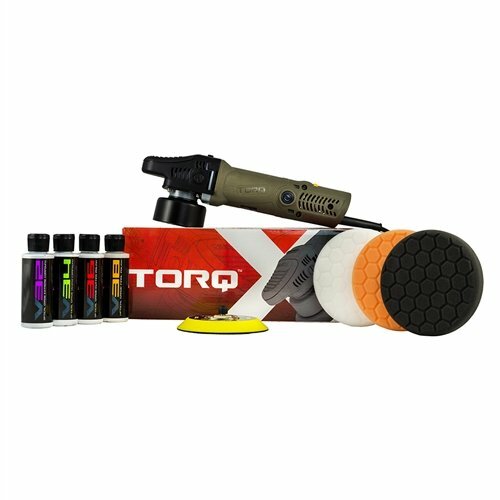 The package includes a Torqx dual action polisher, three buffing pads, and four V-Line sample compounds. In general, users are extremely satisfied with the performance, functionality, and convenience of the Torq random orbital polishing kit. A buyer comments that the orbital polisher kit contains all you need to fix any scratches or swirl marks on your car. He says that the buffer is well-balanced, sturdy and that it would last for years. Another user states that this is a high-quality orbital kit and that the polisher is strong, easy to maneuver and the vibration is minimal. He highly recommends it as the best orbital buffer kit. However, some customers have complained that they received a defective orbital buffer and that it started to turn on and off randomly. A user also notes that the package he received was damaged and that pads weren’t brand new. The first orbital buffer we looked at was the Carand 120 V automotive polisher- it comes in 6 inch and 10 inch versions with the capacity to provide 3500 revolutions per minute on a 120 V motor. The manufacturers say that it ships with a polish applicator pad, foam wax and a microfiber buffing pad. They also claim that their oscillating buffer is specifically designed to provide consistent pressure with built-in venting ports to make sure that the motor cools off quickly for extended polishing use. As well, their orbital polishers are built with a wraparound handles to make it comfortable to polish your luxury sedan in your suburban driveway on sunny Saturday afternoons. Some of the primary features users endorsed are the low-vibrating motor, the aforementioned multi-grip handle, and the tri-layered buffing wheel with its absorbent moisture barrier. Some of the benefits of using a machine polisher is the elimination of water deposits, the removal of swirl marks, and with some diligent waxing the removal of light scratching from your car's paint coat. Users say that as opposed to spinning 360°, it isolates slowly in a back-and-forth motion. One reviewer describes having purchased it to work on his Honda Accord saying that because he parks it outside at work and it is frequently subject to inclement weather, purchasing an orbital car buffer has helped to remove unsightly watermarks from his cars black exterior. One experienced car owner told us that you'll want to purchase a an extension cord to use in conjunction with this orbiting polisher- and then to make sure that you've got the wax in your offhand and a grip on the polisher in your right. Other users concur, saying that even in professional circumstances where auto garages have a detailers buffing cars, they say the polisher is a great way to apply and then remove the polish for a sparkling clean appearance. One buyer did say that he had a difficult time removing wax after it had dried, saying that it left a lot of residue that he wasn't able to buff out. The second random orbital waxer we examined is manufactured by Black & Decker- it provides 4,400 orbits per minute, ships with a 10 foot power cord, and is designed with a two-handle grip. Black & Decker advertise this random waxer as more than capable of providing swirl-free polishes to boats, cars and trucks-with an ergonomic grip that means a hassle-free polishing experience. It's important to know that this is not an adjustable speed random orbital polisher- it only goes at the one 4400 rpm speed. Some buyers who had kitchen remodeling jobs to do used this Black & Decker orbiting waxer for a kitchen floor- not a bad idea as long as your kitchen isn't too large. One buyer we spoke with enthusiastically endorsed this inexpensive Black & Decker random orbiting polisher, saying that it is ergonomically designed so that you can hold it in different ways to get into remote locations of vehicles. In addition, he told us you can exert a fair amount of pressure on it to get a good buffing without overexerting of the motor. The 6 inch foam applicator bonnet is small enough to access crevices of automobiles that traditionally are difficult to buff out using a machine- and often require the attention of your manual energies with a rag to get them polished. One long time user told us that it makes sense to purchase after market buffing pads off the Internet- in his experience they are better quality and provide a better finish on the vehicles he's worked on. As well, this reviewer told us that you should give yourself some time to familiarize yourself with how it works, playing around with different waxes and polishes before giving up on it. Buyers also endorsed using NuFinish, Turtle Wax and Chemical Guys products especially for luxury cars to get the best shine for your money. The third orbiting polisher we examined is produced by Wen- it provides 3200 orbits per minute powered by a 120 V permanent magnet motor. This 10 inch waxer includes, as the other orbiting polishers do, a dual handled grip to provide you greater control and accuracy when buffing your car. One Wen buyer we spoke to says that he is fairly satisfied with this orbital buffer, saying that it spins a little bit less when you exert pressure, but for his purposes it's been solid at removing the light scratches from his Corvette. Other Wen buyers say that the included bonnets are inadequate and that it makes sense to invest in high-quality foam and microfiber bonnets to really wax and polish out unsightly swirl marks and light scratching. For deeper scratches, it's recommended to invest in more abrasive compounds while utilizing a wool bonnet. Another reviewer who was interested in revitalizing his dilapidated pick up truck says that he employed a Meguiar polish and then used this Wen buffer- he found that it's not the most powerful tool he has ever used, but after several hours his formerly grimy truck was looking almost brand-new. Another buyer who owns a Grady White fiberglass fishing boat told us that for this large of job he appreciated the ergonomic design of the grip and the comfortable oscillating movement- he told us it was easy to use and the 10 inch pad provided greater surface area coverage than other smaller-sized bonnets. The fourth variable speed polisher we examined is manufactured by Porter-Cable- this is a random orbiting polisher that provides a swirl-free car buffing. Unlike other options, this is a variable speed polisher providing dial-adjustable speed of 2,500 all the way up to 6,800 orbits per minute. 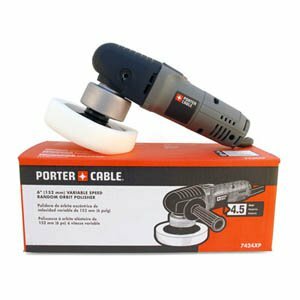 Porter-Cable advertises it as ideal for marine and automotive applications with a 4.5 amp motor providing powerful polishing on a 6 inch polishing pad. Buyers, for the most part, were pleased with this Porter-Cable machine polisher saying that for detailing it work it has been exceptional. One reviewer who works detailing cars says that this dual action Porter-Cable polisher is a cut above your traditional rotary polisher-saying it has been an essential tool and his auto mechanic garage for waxing in restoring vintage cars. 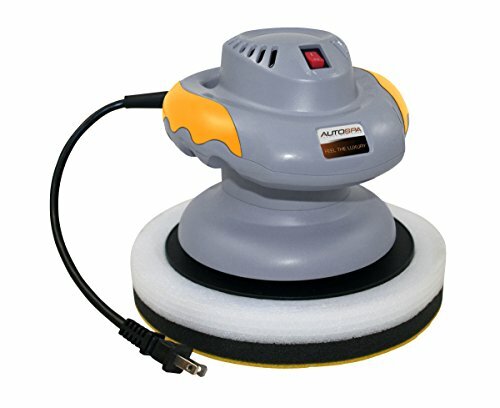 Buyers advise purchasing an additional hook and loop, a Velcro buffing pad, to fit this Porter-Cable variable speed polisher for ease of use. The last random orbital polisher we looked at was produced by TORQ. They advertise its ability to quickly and easily apply glaze, sealant and wax two cars and boats with intuitive controls to make short work of polishing jobs. It is advertised for car enthusiasts- a high-quality option to spread wax, polish car paint, remove scratches and swirls and brighten up the clarity of your vehicles headlights. It's powered by a 680 W motor that generates a gentle dual action polishing motion for working on durable as well as sensitive car paint finishes. One buyer told us that this is a well-constructed machine- but in order to get the best results you'll want to put in the time to understand how it works. He told us that start, you should wash your car with microfiber cloth, apply a clay bar to your vehicles glass and paint, create a distilled water/isopropyl alcohol combo and a spray bottle to help strip away sealant, clay bar and wax, and then figure out if you want to use a compound or just perform a polish on the car. 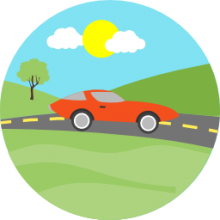 He advises that when it comes to deep scratches that have penetrated the color coat of your vehicle-you won't be able to polish out those scratches.